The land upon which the Greer Mill was built was homesteaded by Thomas Simpson in June 1854. Samuel W. Greer acquired it from the Simpson family on August 1,1860 and built a gristmill there. During the Civil War, Greer earned the rank of Captain for service in the Confederate Army but while he was away bushwhackers burned the gristmill at Greer Spring and had driven off most of the livestock from the farms in that area leaving the farmers in economic difficulty. Although the area was in dire economic straits, Greer rebuilt the gristmill and began milling operations immediately. Oxen hauled logs and grain up and down an extremely steep hill and Greer had a team that was trained to make these trips without a driver. 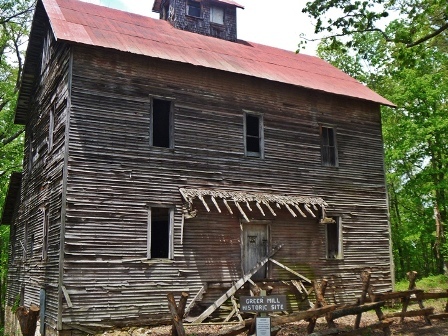 This mill operated until about 1883 at which time a new and larger dam was built and a roller mill was constructed on a hill about three-fourths of a mile above the spring. Greer installed a turbine waterwheel and built a three-story mill building. Until the roller mill was constructed the community had little access to flour. Ground wheat products had to be hauled into the area in wagons over long distances from railroad towns and river ports along the Mississippi River. The scarcity of flour made it too costly for most settlers who had to be content with corn bread and cornmeal mush. Construction of the new mill was completed in 1899 and began operating immediately. Greer had defied engineering logic by placing the mill machinery uphill from the power source which was the dam below but with ingenuity and creativity, he found a way to make it work. The new mill was so popular they could scarcely keep up with demand. Farmers who lived some distance away would have to stay two or three days while their grain was processed. A log house was built to house these customers. It included a corral to contain the horses or mules of the farmers. A well was dug and lined with rock to supply the guests with water. In 1899 Captain Greer sold his interest in the mill to George Mainprize who continued to operate it until 1909. Captain Greer sold the land, including the Greer Spring, to Louis Houck on December 22, 1904. Houck sold it to the Missouri Iron and Steel Corporation of St. Louis in August 1919, and they sold it to Louis E. Dennig on April 28, 1922. In the 1990s the land was purchased by the Nature Conservancy for preservation of wilderness.